I've noticed that there isn't one place online where you can find information about all things New Church/Swedenborgian. Individual denominations have information about their programs, individual bloggers had links to things that they like, etc. but there's no place that collects them all together and organizes them. So I've ambitiously decided that New Church Thought should do this and I'm calling the project New Church Content Directory (NCCD). Exciting, huh? And then here's another great video from Curtis Childs. This one is about the desire to to say, "Ha ha! I told you so!" to the people whose predictions about May 21st didn't come true. Honestly, you should just subscribe to his channel (offTheLeftEye) already. The Bryn Athyn Cathedral has been streaming audio from their services for years. Now they're also offering live video streaming, using USTREAM. You can find more information about their audio and video streaming options on the Live Services page of the Bryn Athyn Church website. 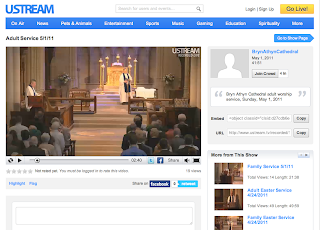 I haven't actually tried it out during a service but I have taken a look at the archives on Bryn Athyn Cathedral's USTREAM channel and I was impressed by the quality of the video. I was expecting it to be one badly positioned webcam, streaming grainy footage but, it looks like they've got at least 2 cameras that are well positioned to give pleasant shots of the service and the footage isn't too grainy, even in fullscreen mode. Let me know if you've tried streaming a service live. Nunc Licet Bible Study Now Available Online! "Nunc Licet" is a Latin phrase which means "now it is allowable." This phrase was used by Swedenborg to describe how it is now allowable to enter into the truths of the Word with our understanding. For this reason Rev. Jonathan Rose chose "Nunc Licet" as the name of a bible study he offers in Bryn Athyn PA, and recently also online. This class regularly receives great reviews. Why? In addition to all that Rev. Rose brings personally, this class takes a fairly unique approach. The approach is to look at "the bible, the whole bible and nothing but the bible, through a Swedenborgian lens, with the special purpose of experiencing the Lord in the text." Often in New Church circles, the writings of Swedenborg are studied directly, but in this case the attention remains firmly in the powerful, direct and often confusing teachings of the Old and New Testament.